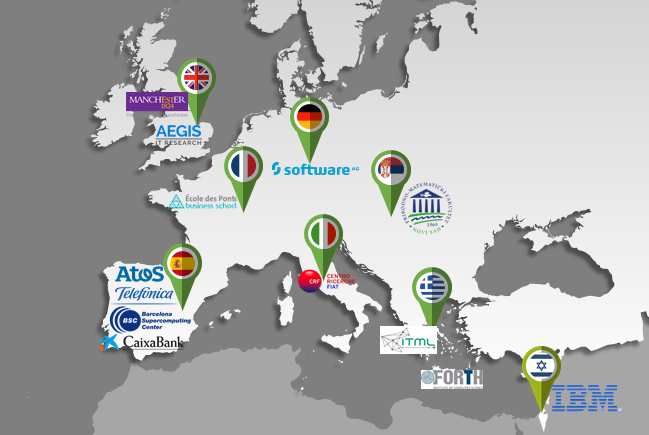 The consortium includes partners from eight (8) European countries: France, Germany, Greece, Spain, Serbia, Italy, the United Kingdom, and Israel. The Foundation for Research and Technology - Hellas established in 1983, is the largest Greek State R&D Centre. FORTH hosts six major Research Institutes. The Institute of Computer Science (ICS) has established an internationally acknowledged excellence in conducting basic and applied research, developing applications and products, and providing services. FORTH coordinates the project through the Distributed Computing Systems (DCS) laboratory, which is active in systems-security and network-monitoring research. FORTH as the Project Manager will ensure that I-BiDaaS tools and technologies are following the state of the art with respect to the literature and are progressing a few steps beyond. As far as technologies are concerned, FORTH brings in experience for real-time intrusion detection, distributed network monitoring, high-speed data analysis and text processing through pattern matching in GPUs, access control, and hardware security. All these competencies match the requirements necessary for success in the project. The Barcelona Supercomputing Center was established in 2005 and is the Spanish national supercomputing facility and a hosting member of the PRACE distributed supercomputing infrastructure. The Center houses MareNostrum, one of the most powerful supercomputers in Europe. The mission of BSC is to research, develop and manage information technologies in order to facilitate scientific progress. The main role of BSC in the project is as technology provider, with different tools: the COMPSs programming model, the Hecuba data store, and the QBeast framework for optimization of database queries. COMPSs will be used to implement innovative algorithms for machine learning, and together with Hecuba will form one of the two main ways of processing data in the project: the batch data processing framework. While we do not foresee any changes needed in COMPSs for the development of these new algorithms, both Hecuba and QBeast will be adapted to the requirements and needs of the architecture designed and the use cases that will exploit it. IBM Israel Science and Technology, better known as IBM Research – Haifa, was first established in 1972. Since then, the lab has conducted decades of research vital to IBM’s success. The lab is one of 9 research laboratories located outside of the United States, and has close working relationships with IBM Israel and its twin research laboratory in Zurich. IBM will contribute to the project the Data Fabrication Platform technology to generated synthetic realistic data. It will allow big data to be safely, securely and anonymously shared across distributed and potentially open processing/storage platforms, such as cloud-based systems, without leaking information to other, unauthorized, system users. IBM plan to explore and develop support for automatic data fabrication rules creation based on advanced machine-learning algorithms for meta-data and data analytics. Centro Ricerche Fiat is one of the main private research centres in Italy. It was founded in 1978, with the mission to develop and transfer innovative products, processes and methodologies in order to improve the competitiveness of the products of FCA (FIAT Chrysler Automobiles). CRF will offer one of the three project’s real-life industrial experimentations, namely manufacturing and particular a case from the Automotive industry. CRF will serve as project’s data provider and will detail the industrial requirements of the Automotive industry. It will also provide the methodological framework for the development of the use cases and apply it on the selected FCA process in industrial settings. CRF will also act as the Innovation manager of the project and will provide an analysis of the business case for the successful introduction of the I-BiDaaS output to the Automotive sector. As global software company and technology partner in I-BiDaaS, Software AG will contribute its extensive expertise in application and solution development, service-oriented architectures, API management and streaming analytics to help design the prototype of the intended I-BiDaaS platform. Besides its role in platform design and development, Software AG also provides technologies via the IBiDaaS platform based on open standards, allowing SMEs to gain access to an industry-leading technology stack such as complex event processing for real-time analytics of IoT machine/ sensor data or predictive analytics. CaixaBank is the third largest financial institution in Spain and it is currently the leading force in Spanish retail banking. CaixaBank has a network of more than 5,000 branches, more than 9,500 ATMs, and a workforce of over 32,400 employees. CaixaBank has the largest customer base in Spain – 14 million people – and is the main bank for 1 in every 4 Spanish customers. CAIXA will offer one of the three project’s real-life industrial experimentations, namely finance and particular a case from the banking industry. CAIXA is offering, prior to anything else, privacy and security. CAIXA is working with big data technology from 2014 and is able to offer now a data warehouse with more than 2 PB of structured information from more than 300 different sources. Additionally, due to regulation requirements, CAIXA has some data sources with more than 10 years of historical depth. Moreover, CAIXA data from data warehouse were used and enriched during more than 40 initiatives deployed in the last two years to create advanced models for business evolution prediction, but also for internal processes optimization and automatization. CAIXA has more than 700 active users of data warehouse (employees and external users). Therefore, CAIXA provides knowledge and experience of a financial environment, but also advanced big data infrastructure being able to process big amount of data in real time. The University of Manchester is one of the UK’s leading universities with a strong presence in the top World University Rankings consistently ranked amonst the 10 best Universities in Europe. It is currently ranked 29th in the world (9th in Europe) in the QS World University Rankings and 35th in the word (7th in Europe) in the Academic Ranking of World Universities (Shanghai ranking). The University of Manchester contributes its expertise to the areas of Conceptual Modelling, Requirements Engineering, Cloud Computing, Distributed Computing, and large-scale data management. Ecole National des Ponts et Chaussees aka Ecole des Ponts ParisTech was created in 1747 to train highly-specialized engineers. Among the top 3 leading French engineering grandes ecoles it is also the leader of executive education via its Business School (Europe, Africa and Asia) and a second subsidiary, Ponts Formation Conseil (technical continuing education especially in France), as well as a wide range of highly-specialized master’s programs. Within the project, ENPC acts as the Exploitation Manager. Atos is a leader in digital services with 2014 pro forma annual revenue of circa €12 billion and 100,000 employees in 72 countries. Serving a global client base, the Group provides Consulting & Systems Integration services, Managed Services & BPO, Cloud operations, Big Data & Cyber-security solutions, as well as transactional services through Worldline, the European leader in the payments and transactional services industry. ATOS is bringing in a dedicated cluster for computations. It will also explore scalability and elasticity aspects of the analytics and how they can be achieved by an optimized cloud resource management and orchestration middleware. The infrastructure layer which includes the actual underlying storage and processing infrastructure of I-BiDaaS solution, is also provided and managed by ATOS. Moreover, ATOS promotes the aspect of the selection of cloud resources required to follow dynamic properties of the applications, avoiding both over- and under-provisioning, but also enabling resources on-demand. AEGIS IT RESEARCH is a research and development company based in the UK. Its aim is to foster world-class computer science research in Europe. We have created a highly effective research team consisting of talented researchers from all over the world. Our areas of expertise include forensic analysis, visualization systems, Geographical Information Systems, secure embedded platforms, access control and network security systems, privacy preserving systems, and so on. Within the project, AEGIS acts as the Dissemination Manager. Moreover, AEGIS will provide I-BiDaaS interactive and intuitive visualization toolkit and a multi-purpose interface that can be used by different categories of users (IT and non IT-experts). Founded in 2011, Information Technology for Market Leadership (ITML) is a global enterprise headquartered in Athens, Greece. ITML has active participation in numerous H2020 projects as technology provider and systems' integrator in the fields of Smart Transportation (e.g. H2020 Project Transforming Transport, 2017-2020), Smart Production Digitisation and IoT (e.g. H2020 ECSEL Projects Productive4.0, 2017-2020, and I-MECH, 2017-2020), Big Data Analytics (e.g. H2020 Project I-BiDaaS, 2018-2020) etc. Within the project, ITML leads the Integration of the framework developed. ITML provides technologies and expertise mainly towards the integration of all project’s Big Data analytics tools towards the envisioned I-BiDaaS platform. University of Novi Sad Faculty of Sciences is an educational and research institution with 5 departments, around 600 employees and 6000 students, comprising education and research in the following disciplines: chemistry, biochemistry, environmental protection, biology, ecology, physics, computer science, mathematics, geography, and tourism. Within the project, UNSPMF is the Scientific and Technical Manager. UNSPMF has a significant expertise in developing distributed optimization and machine learning algorithms for Big Data analytics. UNSPMF provides data analytics (machine learning) algorithms which are integral parts of the project platform and of the project developed pilots. Telefónica I+D is the research and development company of Telefónica Group. It was founded in 1988 and its mission is to contribute to the Group’s competitiveness and modernity through technological innovation. With this aim, the company applies new ideas, concepts and practices in addition to developing product and advanced services. TELEFONICA will offer one of the three project’s real-life industrial experimentations, namely telecommunications.